Many young readers and families with children have enjoyed the vividly illustrated, rhyming Heroes for Young Readers books. Now these popular childrens books are supplemented with the new Heroes for Young Readers Activity Books. Are you a teacher, homeschool parent, or Sunday-school teacher? 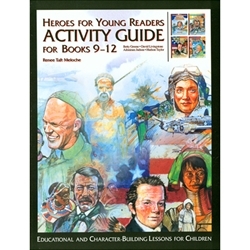 The Heroes for Young Readers Activity Guides are tested learning tools that kids are sure to enjoy. Designed to accompany the vibrant Heroes for Young Readers books and proven to work in the classroom, these fun-filled activity guides are effective teaching tools that lead young children through a variety of character-building and educational activities. The guides allow for great flexibility by letting teachers or parents pick and choose from the activities, tailoring the books to their needs. For those who want to complete all the activities, each guide contains a detailed thirteen-week syllabus for both thirty- or forty-five-minute class sessions.